IOP Marine is official distributor of the CEJN hoses used for the majority of 2- and 4-stroke engines. The IOP-CEJN solutions provide ultra-high flexibility through the entire lifespan of the hose. The low volumetric expansion gives fast response time in hydraulic systems, while the smooth inner bores ensure a minimal pressure drop. ￼A long-lasting service time and extended hose life in even the toughest application is a result of the kink-resistand steel- inforced construction and abrasion-resistant covers. The small outside diameter and the low weight makes the hoses ideal for use onboard, in workshops and at powerplants, while the high burst pressure along with the optional protection cover and 120 angle packing surfaces ensures optimal safety during operation. 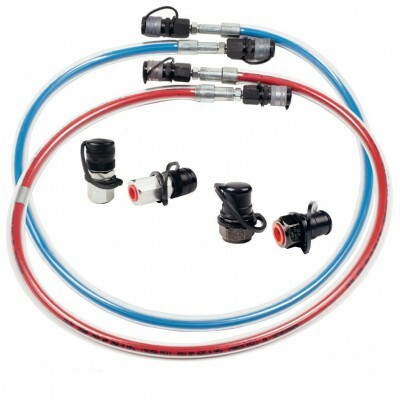 All hoses are approved for use with IOP Marine A/S Hydraulic Power Units or 3rd party test rigs.